A breakthrough treatment is helping area search-and-rescue dogs that played key roles on Sept. 11, 2001, and during other disasters. Red's first assignment as a search, rescue and recovery dog was at the Pentagon following the 9/11 attacks. Years of rescue work and a 12-foot fall from a ladder have taken a toll. Arthritis forced Red into retirement in July and turned her into a couch potato. 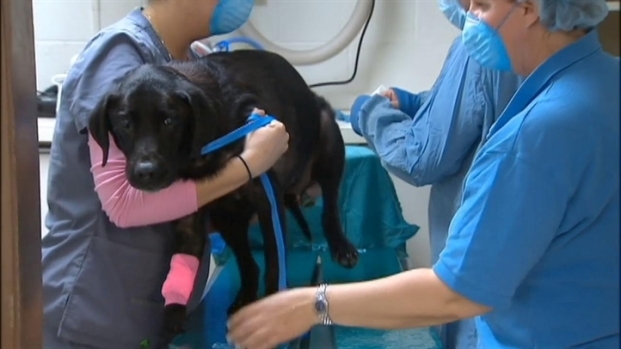 The 12-year-old black lab received a breakthrough stem cell treatment today that will ease her pain and give her more mobility. Her veterinarian, Dr. John Herrity, of the Burke Animal Clinic, has done more than two dozen of the stem cell operations developed by Medivet America, which also donated the cost of the procedure. News4's Darcy Spencer explains how a breakthrough treatment is helping search and rescue dogs like Red recover after years of working in disaster zones. The treatment won't bring Red back out of retirement, but it is expected to put spring back in her step within a couple of months. Two other 9/11 search-and-rescued dogs have been treated with stem cell therapy and are back to their normal activities.